I'd like "Change movement to scroll" feature to be a property of a layer (or maybe chords). It will allow me to have a single switch for all inputs - buttons and the ball alike. 2.17 beta is awesome. It allows me to have scroll and RMB in a convenient way on my Logitech Trackman Marble. But still I have to use another button for button layers switching. I'm not sure I understand what you mean "to be a property of a layer (or maybe chords)." As for adding it to chords, the complexity of the code has prevented this... and it was decided early in the beta phase that XMBC would not support this - certainly not in 2.17 - and I'm not going back on that decision right before release. Maybe something to look into in the future, but I fear it may need a complete restructure to get something reliable given the way the current code has evolved. Really really sad to hear. Option for a layer (checkbox and setup cog button on layer page). When checked, it should always take over movement when that layer is active. Or simpler solution - add layer switching feature to "Change movement to scroll" (layer selection dropdown inside cog button dialog). Other than making list of layers, it will probably be using only already existing code for layer switching (direct reuse or copy-paste if everything is so bad). XMBC is 15+ years old and it has evolved which means its all a bit messy! I#m slowly trying to improve that as I add new things, but at the end of the day, without a complete re-write its always going to suffer a little bit! Regarding the layer movement to scroll, I think I now understand what you mean... When the layer is active, all movement is changed to scroll messages? What is the use case for this (why do you want it)? It might help me figure out just why this would be useful (to you and to others) which will no doubt influence my decisions moving forward (with 2.18 beta I would think). Logitech Trackman Marble has no scroll and basically two usable buttons (two others are hardly reachable without awkward bends on this otherwise very ergonomic device). As I mentioned in opening post, I'd like to get scroll and middle button in a convenient way. Having the single button to change behaviour of all other inputs (buttons and the ball alike) is what I need to make it happen. Currently I have btn2 for scroll and btn5 configured to change to layer 2, where btn1 will do the middle click. As the result, I constantly confuse inputs and trying to do btn5+ball move or btn2+btn1 which obviously not doing what I need (not to mention the trouble of reaching to btn5). All the behaviour switching is hardwired as the single thing in the brain and I'd like it to be the same in software. This means, default action will also be needed with combined layer/scroll switching. The only uncovered use-case is when you have to drag something with the RMB. 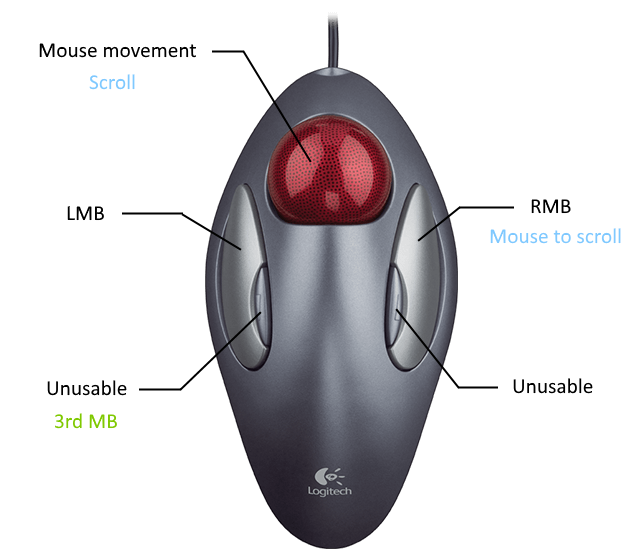 But it is so rare I can map one of "unusable" buttons to RMB too for that. (They are unusable from ergonomic perspective. They are regular button 4 and 5 from software perspective.) Or there is also a possibility to activate default action if no other action is done for a set amount of time. Just realized I can have middle button without layer switching, since I found no other uses for layers so far anyway. But it still requires one awkward bend to reach it. Thanks for the detail Killy, I now both understand and see the point .